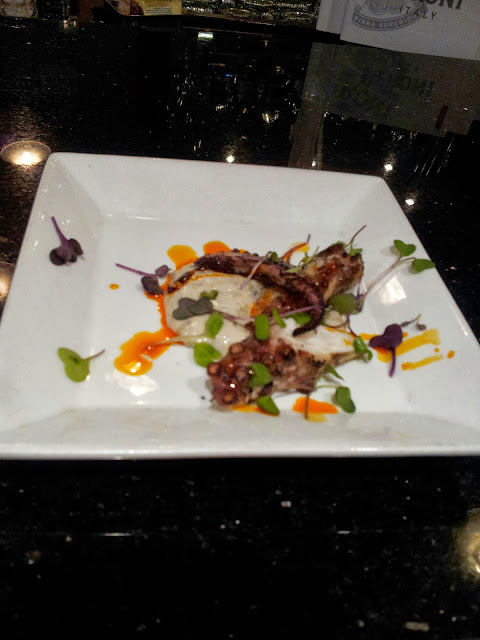 I am not one for trying outlandish things...and to me octopus was a little over the edge. But I am glad I had the opportunity to try it at Ulah Bistro on U Street NW near 12th in Washington, DC. I participated in the Battle Dish presented by Dish Crawl DC and this was on of the dishes presented by the 6 participating chefs. I will probably only eat it here at this restaurant because I know the quality and taste is amazing. If you are ever in the area or in the mood be sure to try them out. This was by far my favorite dish of the Battle. It was prepared by chef Orlando Amaro along with Cannellini beans, olives and caper emulsion which was out of this world. The restaurant has a great atmosphere with two levels and two full size bars that are equally nice.